Overall nice clean room at a very low rate. Only stayed overnight, but can’t beat the price. Where to find State College hotels near an airport? Where can I find hotels in State College that are near tourist attractions? There's a broad range of accommodations if you are looking for a comfortable room in or around State College. Expedia's comprehensive database features 25 hotel and apartment options within 0.1 kilometres (0.06 miles) of State College's heart. Within a 1-kilometre (0.6-mile) radius of State College's center, you can find a selection of Expedia-listed accommodations, including the The Atherton Hotel, an Ascend Hotel Collection Member and Days Inn Penn State. Bellefonte is an accommodation area that is situated 17 kilometres (11 miles) from the main part of State College and has 2 Expedia-listed accommodations. The Riffles and Runs B & B and Econo Lodge Bellefonte are just some of the hotels in and around Bellefonte. Burnham, Mifflintown and Boalsburg are alternative State College neighborhoods that offer accommodation. In Burnham, the section of hotels include the Quality Inn & Suites and Super 8 Burnham Lewistown. While Mifflintown's hotels include the Econo Lodge Mifflintown and Knights Inn Mifflintown. Situated 9 kilometres (5 miles) from downtown State College, Boalsburg has a selection of hotels including the Springfield House and Springfield House Bed and Breakfast. At Expedia, we know that all travelers have varying needs and budgets. If you're seeking somewhere to base yourself that is at the more affordable end of the spectrum, State College offers some solid options. 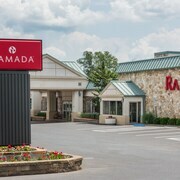 2 kilometres (1 mile) away from State College's downtown area is where you'll find the Ramada State College Hotel and Conference Center. The Days Inn Penn State is just 0.3 kilometres (0.2 miles) away. Other budget-concious options in State College are the Comfort Suites State College and the Quality Inn & Suites. The Holiday Inn Express State College at Williamsburg Square is 4 kilometres (2 miles) away from the heart of State College. Another alternative is the Toftrees Golf Resort, which is located 5 kilometres (3 miles) away. Two other Expedia-listed accommodation options are the Best Western Plus University Park Inn & Suites and the The Penn Stater Hotel and Conference Center. The wider Central Pennsylvania area is worth exploring too. Check out Central Pennsylvania's traditional villages and art museums and also admire the area's rivers. Popular things to do in this particular part of United States of America include hiking. 85 kilometres (52 miles) from State College you'll find DuBois, where you can visit Sandy Township Recreational Park and Dubois Area Historical Society. Should you wish to stay in DuBois, check Expedia's booking pages for the latest deals at the Hampton Inn DuBois and Holiday Inn Express Hotel & Suites DuBois. 55 kilometres (34 miles) to the northwest of State College, is Clearfield, which is home to the Hampton Inn Clearfield and Comfort Inn Clearfield. The Lock Haven University Clearfield and Clearfield County Courthouse are a couple of the more popular sites to see when you're in Clearfield. 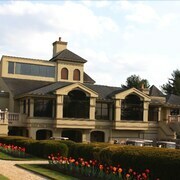 Located 6 kilometres (4 miles) from State College is University Park Airport. 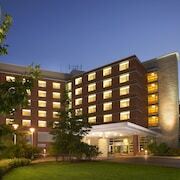 Stay nearby at Carnegie Inn & Spa, an Ascend Hotel Collection Member or Hampton Inn State College. What are the most popular State College hotels? Are there hotels in other cities near State College? What other types of accommodations are available in State College? Explore State College with Expedia.ca’s Travel Guides to find the best flights, cars, holiday packages and more!